Arab Management: Complexities, Context and Perspectives! | My Majid Books! Home » Arab Management Books » Arab Management: Complexities, Context and Perspectives! Book Website – To Order Directly! About The Book! Book Behind Cover Writing! This is my 27th book and the 6th in The Arab Management Series! 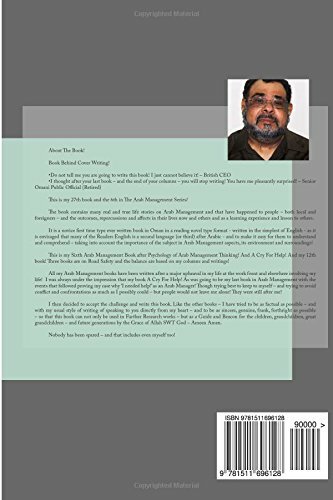 The book contains many real and true life stories on Arab Management and that have happened to people – both local and foreigners – and the outcomes, repercussions and affects in their lives now and others and as a learning experience and lesson to others. It is a novice first time type ever written book in Oman in a reading novel type format – written in the simplest of English – as it is envisaged that many of the Readers English is a second language (or third) after Arabic – and to make it easy for them to understand and comprehend – taking into account the importance of the subject in Arab Management aspects, its environment and surroundings! This is my Sixth Arab Management Book after Psychology of Arab Management Thinking! And A Cry For Help! And my 27th book! Three books are on Road Safety and the balance are based on my columns and writings! All my Arab Management books have been written after a major upheaval in my life at the work front and elsewhere involving my life! I was always under the impression that my book A Cry For Help! As was going to be my last book in Arab Management with the events that followed proving my case why ‘I needed help!’ as an Arab Manager! Though trying best to keep to myself – and trying to avoid conflict and confrontations as much as I possibly could – but people would not leave me alone! They were still after me! I then decided to accept the challenge and write this book. Like the other books – I have tried to be as factual as possible – and with my usual style of writing of speaking to you directly from my heart – and to be as sincere, genuine, frank, forthright as possible – so that this book can not only be used in Further Research works – but as a Guide and Beacon for the children, grandchildren, great grandchildren – and future generations by the Grace of Allah SWT God – Ameen Amen. Nobody has been spared – and that includes even myself too!